After the first Inspiring dance residency at NAISDA last May, a second four day residency was held this October. Amelia McQueen and Lisa Griffiths worked with 1st and 2nd year students, who as Indigenous and Torres Strait Islander developing artists, come from all over Australia. This workshop program draws on the ideas and the creative tasks that were explored by Tanja and her collaborators in the making of the major works Twelfth Floor and construct. Amelia and Lisa also taught dance technique sessions. Both residencies at NAISDA are projects developed by the Tanja Liedtke Foundation (Germany), with additional support through the Tanja Liedtke Endowment (Australia). It was with great pleasure that the Tanja Liedtke Foundation was able to support the delivery of a selection of the inspiring dance program to the 3rd and Diploma year students of NAISDA Dance College last month. NAISDA is the Australian national college for Aboriginal and Torres Strait Islander dance education. Students of NAISDA come from Australia’s urban, regional and remote areas to study both contemporary and traditional dance practices. Kristina Chan and Craig Bary worked with the students in exploring the creative starting points for Tanja Liedtke’s work construct, from where the students devised their own creative material. They also had the chance to learn parts of construct as a repertoire study. For the students this was an opportunity to work with two of Australia’s leading dance artists, experience the work of Tanja Liedtke and apply their creative energy to some very unique choreographic tasks. 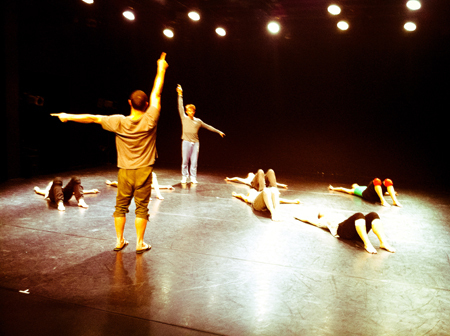 In October 2012, the 2nd and 3rd year NAISDA students will experience the same opportunity. Craig Bary and Kristina Chan (2nd and 3rd from right, middle row), Kim Walker, Director of NAISDA (centre back), with students of NAISDA. The latest inspiring dance program has taken place at the Western Australian Academy of Performing Arts (WAAPA), the Edith Cowan University in Perth, Australia. Following a first stage in July, the second stage will be delivered in November 2012. Kristina Chan and Amelia McQueen spent two weeks in July, with the BA graduate year students - teaching, delivering workshops and also begin the remounting of Tanja Liedtke’s work Slight. Kristina will return to WAAPA for two weeks in November for the final rehearsal period for Slight which is to be presented at the student showcase performance season at the end of 2012. Slight was originally choreographed for, and performed by students of the Taipei International Dance Elite Academy in Taiwan in 2006, and was also performed (by the same Taiwanese students) at the 2006 Dance Creation event in Melbourne. 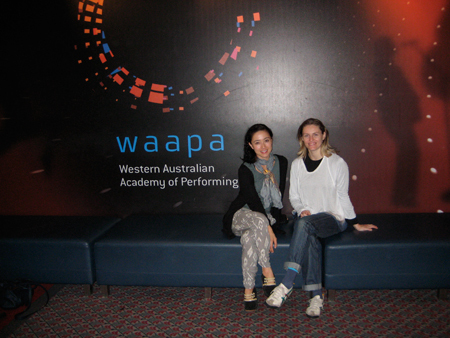 Slight’s presentation at WAAPA will be the first time an Australian cast will dance the work. Paul White at Hochschule für Musik und Darstellende Kunst, Frankfurt. The results of this work were performed as part of a student showcase at the Gallus Theater in Frankfurt, and in July, will also be included in the annual Tanzmarathon which is produced by HfMDK. In March of 2012, Paul White once again spent time teaching excerpts of construct and the duo To My Suite to 3rd year dance students of the University of Frankfurt as well as professional training classes at Tanzlabor_21, which is based at Frankfurt’s Mousonturm. This follows two previous sessions in 2010 when Paul and Kristina Chan worked with students on similar material. In May this year, Paul will return to Frankfurt to re-rehearse the students in the works, which will be performed as part of their graduation showcase. Inspiring dance is an ongoing project in Australia and Germany.